Despite the obvious danger of stains, the great thing about wearing white is that it's a blank canvas that lends itself to numerous options for styling. Even though this dress has a pattern, it is essentially a pretty basic white dress that could be styled in numerous ways. I decided to style it with pops of pink and purple to accentuate the popsicles in the print. 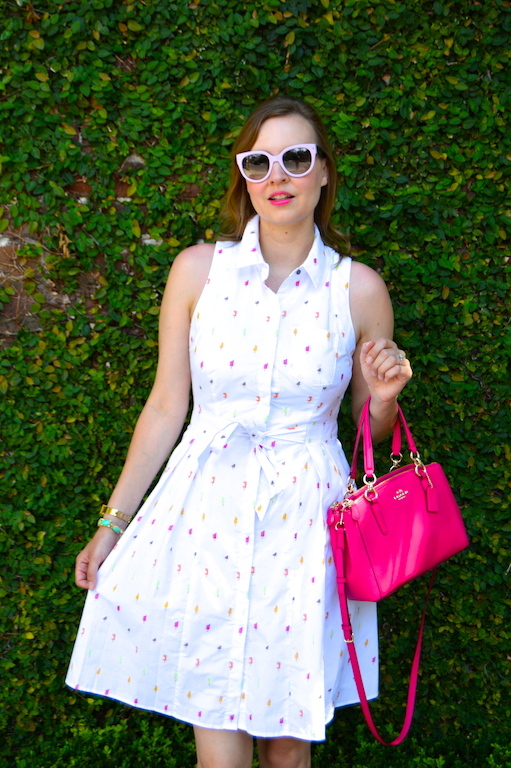 Below I have selected a few adorable white dresses for summer and some fun accessories that would go hand in hand with the dresses just like popsicles go hand in hand with hot weather! Very pretty dress! Button front dresses are my jam right now! That dress is darling! Love the fit! That dress is the cutest, and it does look perfect for the hot, hot weather. I love it with the pink bag. Now you've got me wanting a snow cone...mmm! The popsicle dress is so cute! And like you said white is a blank canvas and I love those pops you gave it! OMG .... sooooo cuuuuute! You're a summer vision, Katie! Oh, how pretty is that dress! I love the classic and simple design paired with those colorful, fun little prints. Oh my gosh.... LOVE IT! I mean, who wouldn't love a popsicle dress?? Purse and sandals goes perfectly with it. 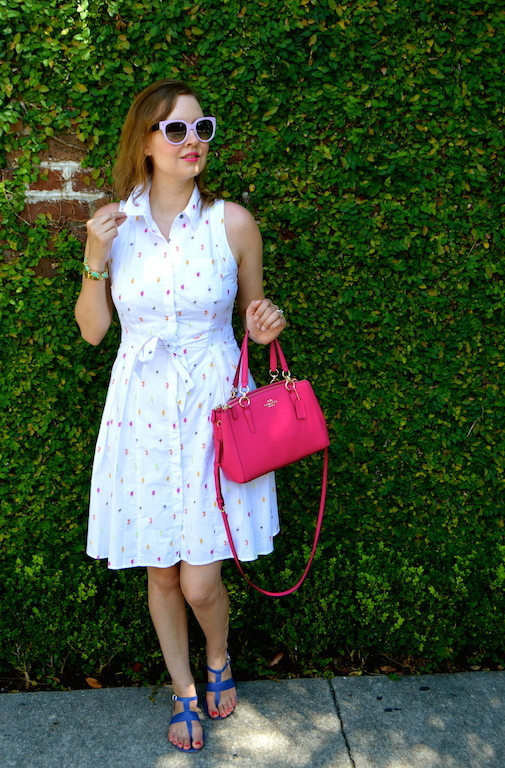 That is such a cute printed dress! Perfect for summer, although I do agree with you white seems like a magnet for spills and stains haha! I like the bright cobalt sandals and pink bag, lovely accessories. Such a cute dress! Great outfit with the bag & sandals! And I can see how much fun you can have changing up the look with different accessories! Oh, how adorable! And I really love your sandals! My sister owns an ice cream truck so she and I both go totally bananas for anything with ice cream or popsicle motifs! She would love this dress, for sure! You always have the brightest, most cheerful outfits! Thanks for linking up On the Edge of the Week. I hope to see you again this week! What a darling dress, I just love the print on it too. 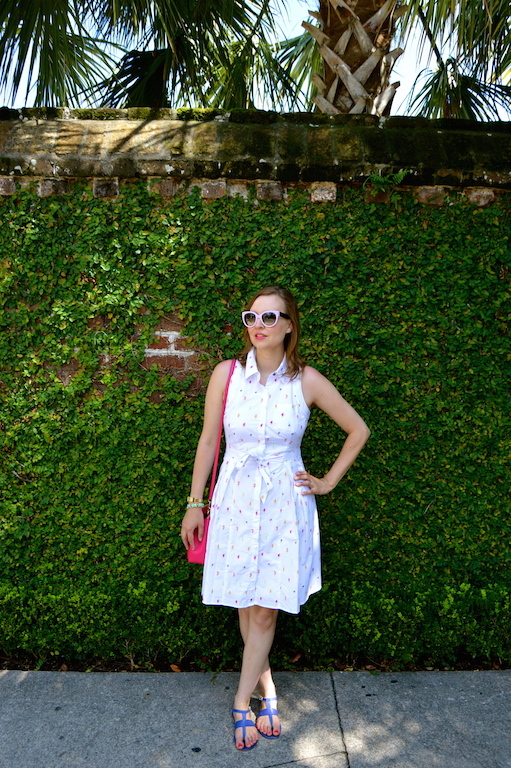 We went to Charleston two years ago in August! I know how hot it can get! Love the print on this, very playful and summery! Looks great on you!